So, you’re looking for the easiest dessert you could possibly make that also tastes incredible? Here it is. It’s not fancy, it’s not difficult, and it’s not really cheesecake, but it’s the ultimate potluck dessert. I send it to work with Ross often and none of it ever comes home. 1. Preheat the oven to 350. 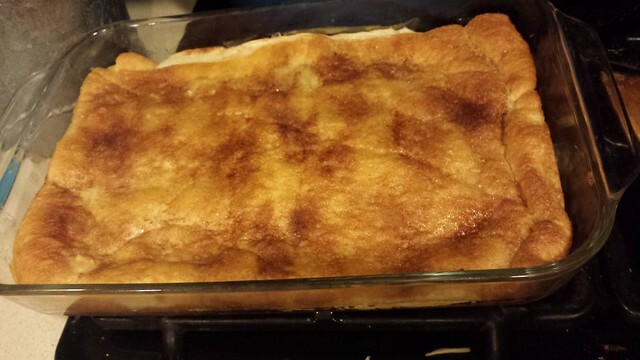 Roll out one can of crescent rolls (don’t break apart) and press into the bottom of a glass 9×13 baking dish. You may need to manipulate it a bit to cover the whole bottom. 2. Beat a cup of the sugar with the cream cheese until fluffy and combined. Using a spatula, spread the mixture all over the layer of crescent rolls leaving about a half inch border around. 3. Unroll the second can of crescent rolls and arrange to cover the top, I press the edges together. Melt the butter and pour over the top, stir the cinnamon and additional 1/4 cup of sugar together and sprinkle over the top. Bake for 25-30 minutes.